Once you make fresh gluten-free pasta, you'll never go back. Fresh Gluten-Free Pasta is absolutely doable. We’re certain you can do this….and we’re totally certain you should! Give fresh pasta a try! Making fresh pasta had become a lovely weekend ritual that my husband and I participated in with some frequency in the years before my diagnosis. He turned the hand crank while I held the dough as it passed through the machine. We’d chat and sip wine, mellow music playing softly in the background. As the pasta rested, I whipped up a sauce or topping with whatever fresh vegetables I’d picked up at the Sunday farmers’ market. It was a wonderful time, and a supper that everyone in the family looked forward to. When I found out I was a celiac, all of that came to a halt. I knew that I could probably make a fairly good gluten-free fresh pasta. However, it would require a new machine (my old one was most certainly contaminated with gluten) and lots of patience as I tested out recipes. Last weekend, we went out and purchased a new machine and made our first attempts. The dough started out very crumbly and dry (we live in a very dry climate), so I added more eggs. Although it was moist enough to come into a ball, it crumbled when we passed it through the machine. I tried adding more xanthan gum. A lot more. I’m not a huge fan of “gums” but they are necessary to achieve the proper texture and elasticity in gluten free pasta. The pasta made it through the roller without falling apart, though the edges were a bit more ragged than I was used to. I was a little worried that it wouldn’t survive the cutting but it held together quite nicely. I draped the strands over the backs of my chairs and counters to let it rest. Later that evening, I boiled the pasta in lightly salted water and tossed it with a rich red sauce. I tentatively took my first bites. I was so relieved that the texture and flavor were exactly like I remembered–amazing! There really is no comparison for fresh gluten-free pasta. Making pasta is a little like making love. The first few times it feels a little clumsy and awkward. Once you get the hang of it (with the right partner) it’s an easy, fun (and dare I say pleasurable) way to spend the afternoon. Ahem. If you are new to making Gluten-Free Fresh Pasta, you may want to cut this recipe in half so it's more manageable. 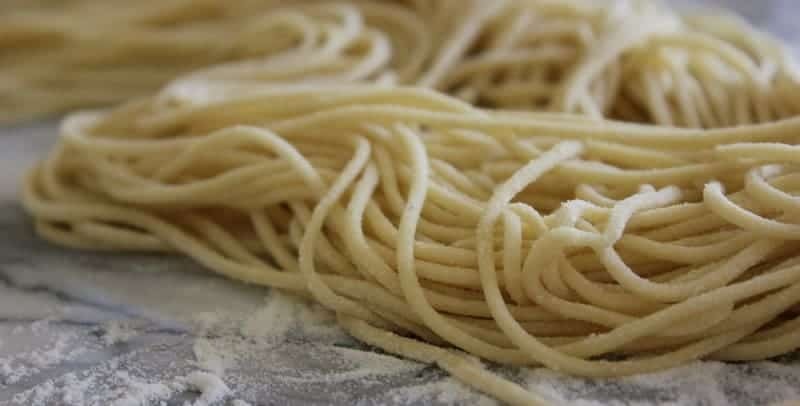 Though it may seem a little challenging to master at first, fresh pasta is quite simple to make, and you really can't beat the taste. I prefer a hand crank pasta machine, but those that can be attached to a KitchenAid mixer are a bit quicker. Pulse flour, salt and xanthan gum in the bowl of a food processor fitted with the steel blade attachment to combine. Add 5 eggs, one by one, pulsing after each, until thoroughly combined. If dough is still crumbly, add one additional egg. Dough should be smooth and only slightly tacky to the touch. Turn dough out onto a board that is lightly dusted with sweet rice flour. Knead dough until it comes together in a relatively smooth ball. Cut dough into four equal parts, and cover with a damp cloth so it stays moist. Cut the first portion of dough into thirds and flatten each part with the palms of your hands. Set your pasta machine (either hand crank or attached to a mixer) on the largest setting (usually 6). Lightly dust the first portion of pressed dough with more rice flour and pass it through the machine, fold it into thirds and pass it through again. Set it aside on a clean dishcloth. Continue in this manner with the rest of the dough.. Turn the pasta machine down a notch to number 5. Pass each portion of dough through the machine again, gently laying them out on the dishcloth. Make sure you start with the dough you rolled out first and follow the same order each time. Turn the pasta machine down another notch to number 4 and pass the dough through again in the same manner. Turn the machine down to 3 and repeat. At this point, the pasta will probably be all over your kitchen counters. 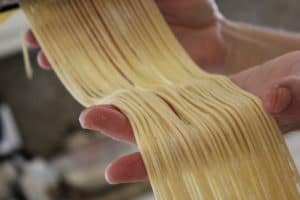 These noodles can be cut by hand into lasagna, or fettuccine shapes, or you can cut the pasta with your machine. To do that, switch out the pasta press for the pasta cutter. I prefer the linguine or spaghetti cutter. Starting with the first pasta rolled, gently pass the pasta through the cutter, catching it with your hands as it comes out. Some of the edges will be shorter in length, and that's okay. Gently lay the longer strands across the back of a chair, on a pasta rack, or on a lightly floured surface. Continue with the rest of the pasta in the same way. 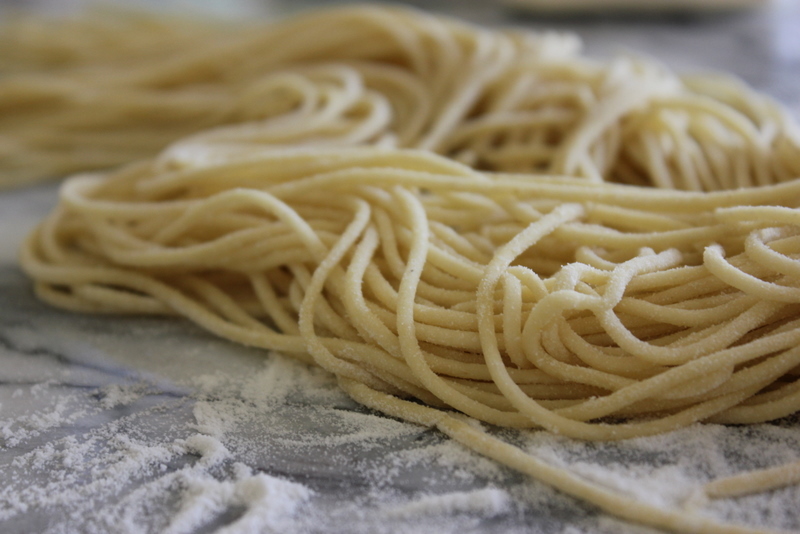 Pasta can be used within a couple of hours, or refrigerated in a sealed container and used within a day or two. To cook: Boil the pasta for 2-3 minutes in lightly salted water. Continually taste for doneness. Toss with any sauce you desire. This entry was posted in Main Dishes, Recipes and tagged Alison Needham, celiac, celiac pasta, dairy free pasta, g-free diet, G-Free Foodie, gf pasta, gluten free, gluten free cooking, gluten free food, gluten free noodles, gluten free pasta, gluten free pasta recipe, homemade gf pasta, homemade gluten free pasta. Bookmark the permalink.